Here are some of the ways schools are leveraging The Graide Network to achieve their strategic priorities. "The value of my Graider is having a second opinion aside from my teacher looking at my work. The more feedback I get, the more I feel invested to get a better score." "Now, The Graide Network creates digital piles for me...I’m able to group students more effectively by areas of need and create targeted, personalized lesson plans and assignments for them." "Without my Graider, my writing would not be at the point that it is at now. They provide detailed feedback that is useful, and they also gave me another perspective on my writing." "In working with The Graide Network, we accomplished our goals and much more. I can see how this program could help us solve the bigger goal of feedback for students and teachers." "Grading support is the fastest and most efficient way to get critical data into the hands of our teachers. It ensures every response is given normed, detailed consideration, and it allows our teachers to focus on what they’re best at: improving student outcomes." "We need to closely measure student performance to validate the effectiveness of the curriculum and test various hypotheses around computer science education." "You really know how to critique informational essays. Comments were excellent. Scoring was very accurate - most scores were just like the ones I would have given. Very prompt - I received the scores the day after I posted the assignment." 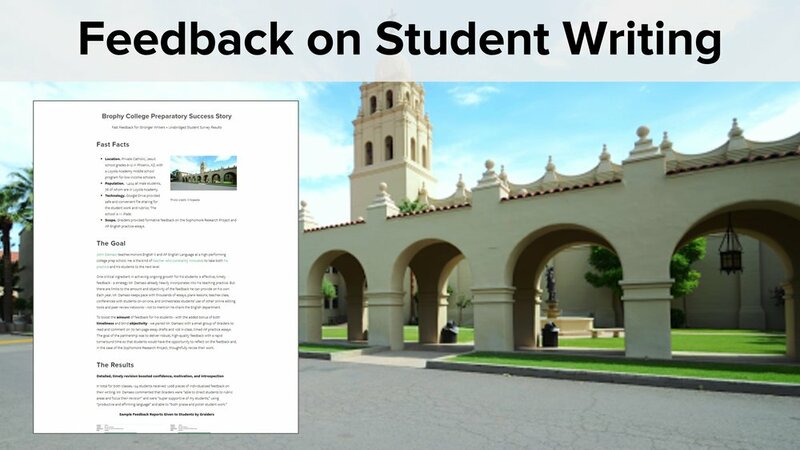 "Amazing attention to detail and feedback; you have crafted responses that are useful and specific enough so that students can use them to grow their writing." "Being able to see such descriptive feedback about my own students reminded me how important such feedback is and what a student is able to take away from it. I was also able to self-check my own biases about their writing." “Combining the freed time and returned data, I could target struggling students knowing that all students got quality feedback."